If any of you have been to my house, you would know that while I could make a great meal…making the cocktail to go along with it is not my thing. That being said, I can open a great bottle of wine or even take the cap off of a beer (lol). I do enjoy the drinking a cocktail part, just not so good at making it. Today I was having a special friend come over for lunch and I thought I’d make a drink to go along with our meal. 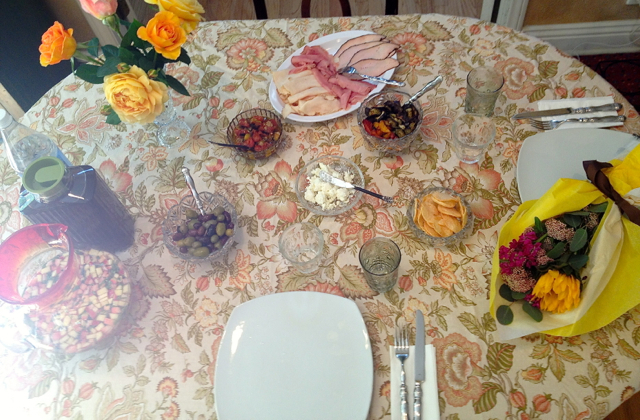 Being that it was a luncheon, I didn’t want anything too strong…let me tell you this…the menu planning was much easier then the drinking menu! 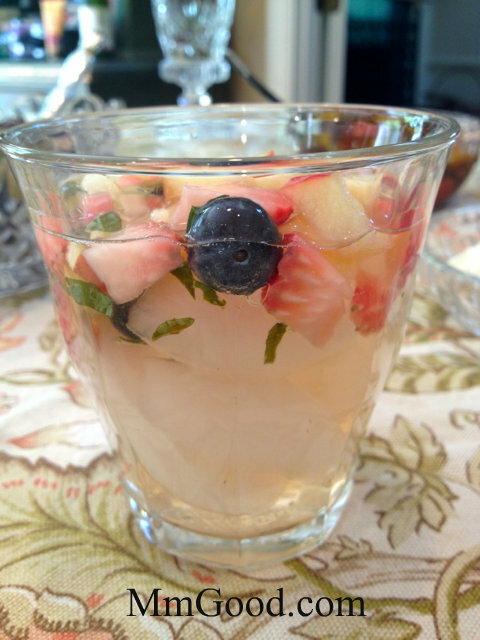 I do like drinking sangrias so I thought why not make a simple sangria but maybe not a traditional sangria…I found this recipe on the web and while I did change it a bit, I can not claim it as my very own as I would never have thought of adding basil in this drink but “OMG” did it make the drink complete. For those of you challenged or not challenged in making drinks, this is a pretty simple and tasty drink. I would recommend making this the night before you serve it or early in morning. 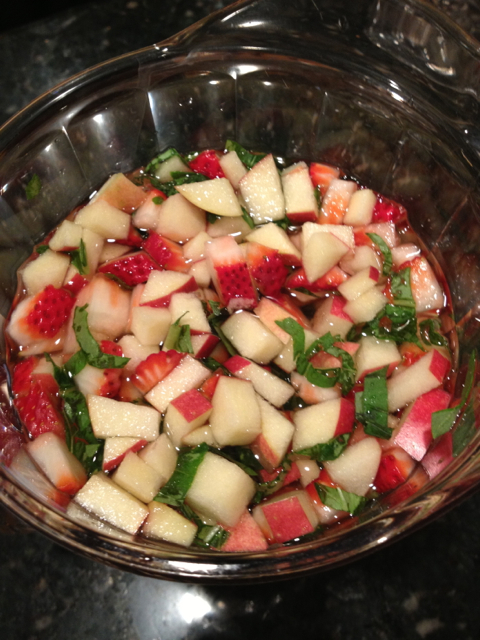 Basically you cut up all your fruit, I used chopped apples and strawberries and placed them in your pitcher, pour your wine and sugar water on top, add your grape juice and then chop up your basil and placed that on top as well. doesn’t it look pretty already? I covered it with saran wrap and placed it in my fridge. Just before my friend came over, I added sparkling mineral water and blueberries and stirred it up, I then poured over ice and served! how inviting is that? From sitting in the fridge over night it turned into this beautiful color, a little girly and perfect for my luncheon! 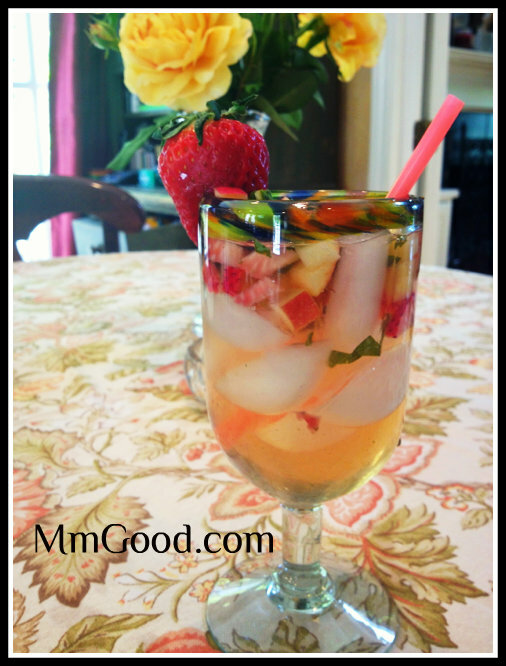 It was so delicious and the perfect drink for summer…let me know what you think! Take your boiling water and place your sugar in it so that it creates a sugar water. Set aside to cool off. 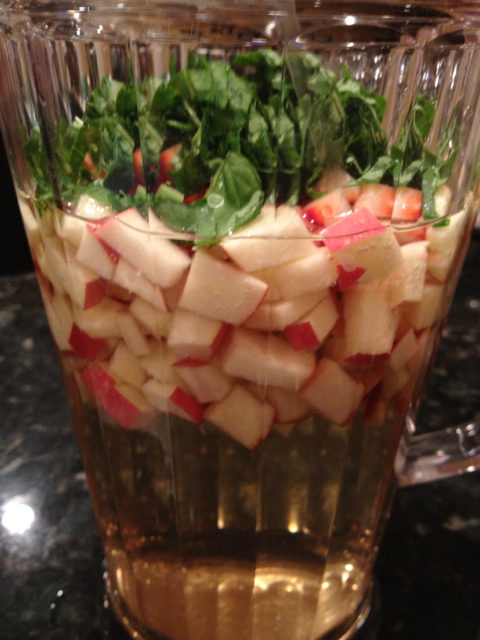 Cut your apples and strawberries into small pieces and place in your pitcher. Pour your wine and grape juice on top of your cut fruit. Add the sugar water. 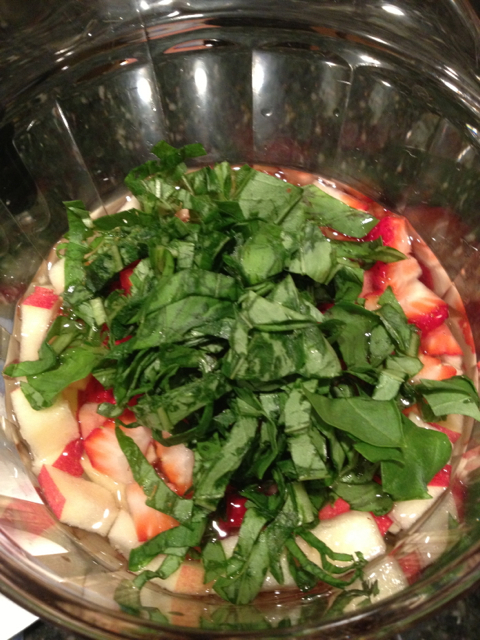 Slice your basil into thin slices and add to your pitcher. Stir. Cover your pitcher with some saran wrap and place in your fridge. Just before serving add your blueberries and mineral water. Stir and serve.